How does intellectual property turn great businesses ideas into growth? That was one of the questions considered at the IPO's inaugural networking conference when 70 UK business advisors discussed the importance of protecting IP rights. When asked about their experiences of defending their IP rights Nick Rutter from home safety innovators Fireangel had an interesting analogy. He saw IP as a series of fences that help to provide security to his business. But as well as putting up the fences you need to continue to innovate to keep one step ahead of anyone who is trying to copy your ideas. Sean Clarke, head of rights at Aardman – the creators behind Shaun the Sheep and Wallace and Gromit - gave a keynote speech. This was a fascinating insight into the ways in which Aardman use their IP rights to succeed commercially. He used Shaun the Sheep, their biggest global brand, as a case study. He explained how they license rights to third parties and the controls they put in place to protect their brands and stay true to their vision as a business. Aardman produce a style guide on Shaun to ensure he is always used consistently. For example you will never see Shaun the Sheep standing on his hind legs when the farmer is present! 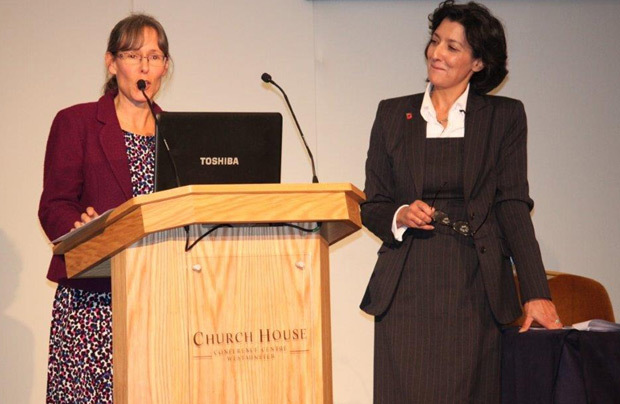 Left to right: Andrea Brewster, with Rosa Wilkinson, Director of Innovation at the IPO. Andrea Brewster, vice president of The Chartered Institute of Patent Attorneys, gave her view on why it is important for business advisors to work with IP professionals. She likened the environment that businesses are operating in as a war zone – with each business fighting for their lives. Business advisors are able to provide triage to business to give critical advice. They are first on the scene assessing a business’ situation, signposting and helping until an IP professional can get there. 1. Connect - Building networks is vital. Making sure you are connected to the right people in your region and making sure you know where to go to get advice and information. 2. Book early - Knowing when to talk to businesses is important. Having an early conversation can help to identify and navigate problems and to plan and build strategies. 3. Never forget to draw intellectual property into conversations that you have with businesses. Fitting intellectual property into a wider business strategy is also important. The conference ended with a call to action to all business advisors: go out and spread the word about the importance of intellectual property to businesses. In the meantime the IPO is committed to continuing to develop the tools and guidance to help advisors and bring people together.